Our technicians are trained & certified to perform diagnosis, service, & repairs. Once you have you car serviced at Junior's Auto Repairs, you will wonder how out managed without us. Groupon | Groupon Deals of The Day! Click link and visit Groupon. Groupon members will have the ability to open there Groupon app after clicking link. 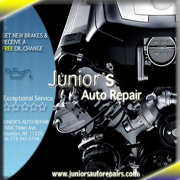 Have you brakes serviced or repaired at Junior's Auto Repairs and receive a free oil change !!! To save on offers below click on link and sign up, or complete offer in open window. Do not close out Browser/Window, wait 3-5 minutes after a completed transaction to ensure processing. *Earn cash back on your card with Advanced Auto Parts. *Click either image to save on fire stone tires. Great Specials at Juniors Auto Repair!